Etheria Film Night has been presenting genre short films directed by women since 2014 and this year’s selection proves to be an eclectic mix honoring the world of genre films of all sorts; from the dark comedy of Skin Deep (dir. Elizabeth Serra) which illustrates the extremes of sibling rivalry to its bloodiest conclusions, to the subtle horror of Creswick (dir. Natalie James) which with its exquisite sound design stays with you much like the presence of the house lingers with the characters of the film. Each of the films not only epitomize the genres they fall into but also entertain and engage the audience intellectually with excellent performances and production values. Laboratory Conditions (dir. Jocelyn Stamat) stars Academy Award winners Marisa Tomei and Minni Driver and leaves the audience wondering what the conclusion of the tale will be – as with any good science fiction the possibilities are numerous. Ovum (dir. Cidney Hue) is another sci-fi film with wonderful acting by Michelle Beck and a thought-provoking scenario. The Agency (dir. Macarena Montero) rounds out the science fiction of the evening with humor – and a distinct lack of romance – as the search for a partner becomes a high-end transaction. The Drop In (dir. Naledi Jackson) gives any Marvel or DC Comics series a run for its money in terms of fight choreography (although my superhero expert/consultant has pointed out to me the fight style is different than those tent pole favorites) with an intriguing plot and captivating performances by Mouna Traoré and Olunike Adeliyi. Lady M (dir. Tammy Riley Smith), a personal favorite because of my affinity for Shakespeare, theatre and fantasy, has exceptional performances by the entire cast and an especially nuanced and delightful one by Samantha Bond as an actress defying age with the magic of theatricality. Bride of Frankie (dir. Devi Snively) mixes horror and comedy for a refreshing recipe which pays homage to Mary Shelley’s tale of transformation and gives it a modern twist. Instinct (dir. Maria Arida) rounds out the horror fare, a psycho-sexual thriller which depicts the art world as a bloody tough business. C U Later Tuesday (dir. Anca Vlasan) on a humorous note brings out the ridiculous in romance. 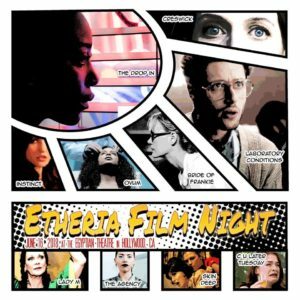 There really is something for everyone at The Etheria Film Night (co-presented by American Cinematheque) at the Egyptian Theatre Saturday June 16th. Tickets are only $15 and include a cocktail reception and Q&A with the filmmakers. Rachel Talalay will be honored with the Etheria 2018 Inspiration Award.